Dr. Terrany graduated from the European school system and received her Doctor of Dental Sciences degree in 1997 from the University Rene Descartes Paris, France. She earned the highest honors for her D.D.S. thesis and publication. After earning her Degree, Dr. Terrany practiced general dentistry while actively pursuing continuing education to ensure she always provided her patients the highest level of dental care. During that period, she developed a keen interest in endodontic therapy, which led her to pursue a post-graduate degree in Endodontics. She completed her residency, certification and Master of Science degree (with a main interest in pulp regeneration) from the University of Texas Health Science Center, Dental Branch at Houston in 2011. 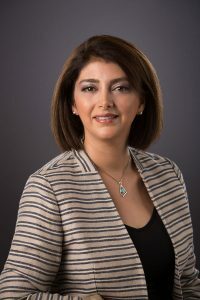 She is also currently serving as Clinical Assistant Professor in the Endodontic program at the University of Texas School of Dentistry. Dr. Terrany loves helping patients overcome their hesitations about having root canals performed and treats every patient like family. “Being able to help patients in pain is the most rewarding practice in dentistry” according to Dr. Terrany, and it is the reason why she specialized in Endodontics. Dr. Parastou’s interest in general dentistry began at the age of twelve while visiting her friend’s dad’s office. She was amazed by the artistic side of dentistry and the gratitude the patients had after being relieved of their pain. Coming from a family of artists and doctors, becoming a dentist became a natural path for her. Dr. Parastou pursued her dream by entering one of the most prestigious dental schools in France. While practicing general dentistry in her private office in Paris, she developed a passion for endodontic therapy. Shortly after Dr. Parastou and her husband moved to Houston she was determined to continue her path to excellence in her field. She completed her post-graduate certification in Endodontics in 2011. Combining her experience in general dentistry and Endodontics to alleviate her patient’s discomfort is Dr. Parastou’s first priority. Nothing is more rewarding to her than “happy and pain free patients”. Dr. Terrany is pleased to have made Houston her home along with her husband and their two children. During her free time she enjoys painting, swimming, traveling and spending quality time with her family and friends.